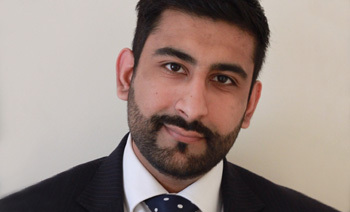 Mufaddal graduated from the University of Leeds in 2006 with a degree in Accounting & Finance. He immediately began working in Financial Services and joined Hargreaves Lansdown as a Financial Adviser in 2013. He has achieved both Chartered and Fellow status with the Chartered Insurance Institute. I would like to place on record how impressed I am with Mr Travadi. He came across as being genuine in wishing to find the best solution to my situation. He was very knowledgeable as I would expect, but also very likeable and had a knack of explaining complex issues. I shall have no hesitation in recommending him and feel he is an asset to your company. Just over two years ago my wife and I became acquainted with Mufaddal after seeking his financial advice for our future retirement. His visit was very worthwhile and his advice proved to be exactly what we wanted for our future. Recently, after a change in circumstances I once again contacted Mufaddal for a chat regarding our finances. He answered initially by email, then personal visit very promptly. He was his usual charming self, enquiring after the family, commenting on our change of address and answering our questions with absolute clarity. Mufaddal does not burden you with complicated financial issues, he speaks in language we understand and answers any feedback with patience and understanding. No question is too silly, he puts you at ease immediately. I would recommend his services to anyone who seeks them without hesitation or reserve. I would like to thank Mufaddal for his professional and friendly approach to the questions I had. I appreciate his guidance and suggestions without giving specific advice at this stage. I will take on board some of the aspects he raised in terms of medium to long term strategy and look forward to contacting him again when I near my goal of semi retirement.